Even though a lot of categories of equipment of the Korean People's Army are known quite well due to satellite imagery and propaganda videos, the rare aspect of the Korean People's Navy (KPN) is often overlooked. Considering the scarcity of footage and high-quality satellite footage of KPN naval ships, this is hardly surprising. However, as is illustrated by the sheer amount of ships being produced over the years, the Korean People's Navy still does play an important role in the current day North Korean military. The most recent developments of this secretive branch has been the introduction of so-called Surface Effect Ships (SES), stealth technology and even domestically produced Kh-35 missiles. The latter, a true game changer in the Korean peninsula, signifies the start of a new dawn for the Korean People's Navy. A North Korean Kh-35 launched from Surface Effect Ship. Note the 76mm OTO Melara copy in the lower left in the second shot. 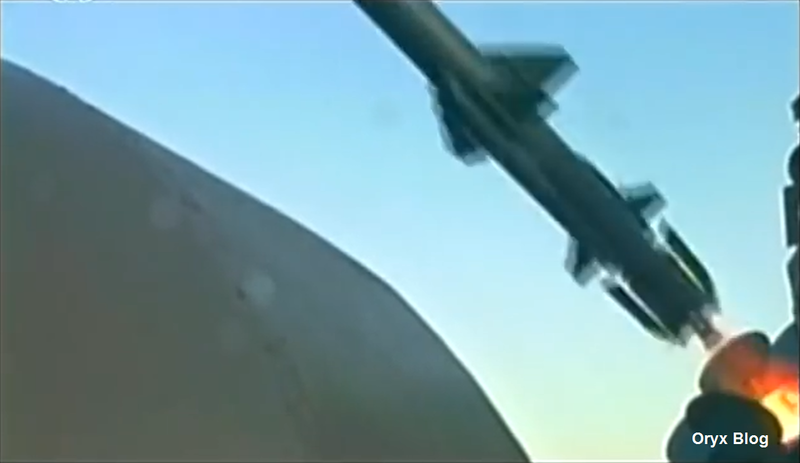 The Korean People's Navy, commonly known to be solely operating ageing P-15 Termit (Styx), HY-2 (Sillkworm) and indigenous KN-01 anti-ship missiles, received two types of anti-ship missiles since the dissolution of the Soviet Union: Chinese made C-802s were supplied to North Korea from Iran in 1999 to help Iran producing this missile for its own navy and Kh-35s (also known as 3M-24) were received from Russia in the 90s. The missile, the Korean designation of which is currently unknown, was also exported to Myanmar. Relations between North Korea and Myanmar reached a peak in the mid 2000s, and also seems to have led to the export of sophisticated weaponry to Myanmar. The Navy of Myanmar, along with other North Korean naval weaponry, installed the missiles on the frigate F11 Aung Zeya. North Korean Kh-35 canisters aboard the F-11 Aung Zeya. The import of Kh-35s was first unveiled in early 2012, when imagery of a North Korean SES was released as part of a military documentary, showing racks used to mount four Kh-35 canisters. The recent surfacing of imagery of the Myanmarian F11 Aung Zeya class frigate confirmed that the missiles are produced by North Korea and actively exported to friendly nations, along with other naval assets. Originally developed by the Tactical Missiles Corporation, the North Korean missile differs in a few areas compared to the original Russian Kh-35. Most notably, the canisters have been extensively modified compared to the original Uran-E launcher. The number of mounts for the stowage of additional missiles has been increased to three and the canister has a much cleaner look compared to the Russian canister. It also appears the engine was modified, as is shown by the cone-shaped exhaust nozzle which appears to be unique to the North Korea design. Lastely North Korea appears to manufacture their own distinctly shaped mounting rack. 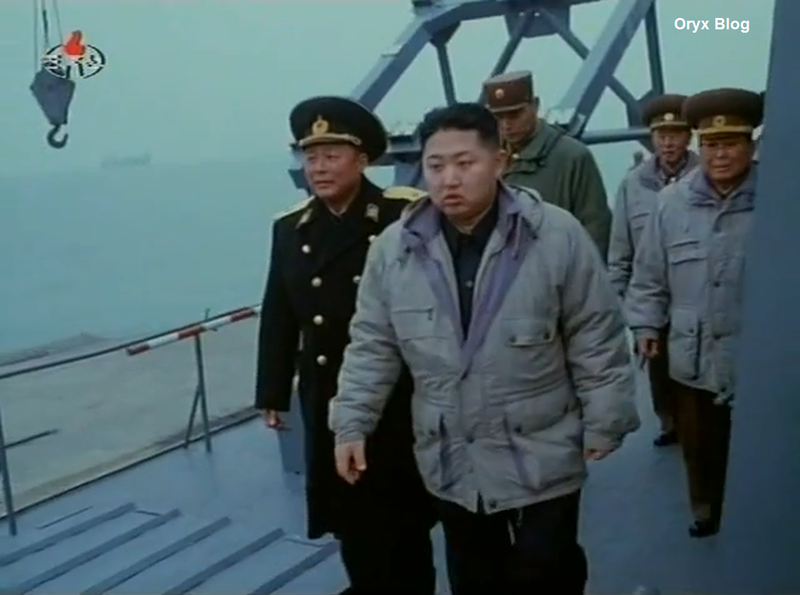 Kim Jong-un walking in front of a quadruple mounting rack on one of the Surface Effect Ships. original Kh-35E is capable of destroying ships up to five-thousand tonnes at a maximum range of one hundred and thirty kilometres while under heavy electronic countermeasures. The missile enjoys a low signature due to its small size, sophisticated radar, sea-skimming capability and capability to resist the strongest of electronic countermeasures. The indigenous Kh-35 missile, the Russian base variant of which is often regarded as the most cost-effective anti-ship missile in existence, is a huge improvement over other North Korean anti-ship missiles, and poses a massive threat to the navies of both South Korea and the United States due to its large range and countermeasure-defeating properties. While the measure to which it is deployed by the Korean People's Navy is as of yet unknown, the missile is likely used on a variety of newly produced naval platforms. This is certain to present a great challenge to opposing forces, and will definitely have serious implications on naval balance in the area. Although it has only just been publicly confirmed the Kh-35 is in use by North Korea, their first usage by the DPRK dates back to the 90s, a testimony to the capability of the secretive state to keep prying eyes away from military projects. The domestically produced Kh-35 is to form the spearhead of the Korean People's Navy striking power for years to come. You might want to also see this page. There is a link to the recent Myanmar Sea Shield 201 exercise. Could you be so kind to post the link? on December 13. Kim Jong Un has inspected the base Pip'agot, from the images published are identifies a class frigate Najin showing some news, news that had already been partially identified by a satellite during his stop to work at Namp 'o. stern of the ship system combined by 57 mm, the AK-230 30mm turret, the radar of fire Drum Tilt and search radar were removed, and installed several new systems, from the picture you can see two turrets should be the new CIWS turrets NK 6 rotating barrels 30mm already seen the frigate F-11 Navy Myanmar, the Koreans have installed the system to six rods in a turret similar to the AK-230 that was already produced in the country. The turret AK-230 landed in the space made available, which could be used to install an anti-aircraft missile system NK. from photos taken in December on the basis of Pip'agot highlights the absence of both the turret AK-230, both containers missile P-15 / HY-2/01 KN, in the foreground, however, you can see the pylons on which you should install the pitchers for new anti-ship missiles like the Kh-35 Uran, pylons already identified on one of the new FAC made in North Korea, probably the pylons will be installed on Najin 2 for a total of eight missiles. Probably the modification work will be completed at this base, the images can be identified yet installed the twin turrets 2M-3 25mm, who knows if the Koreans replace them with the new turret from 14.5mm to six rotating barrels already seen on other units their navy. 41:58　You can look the Northkorean MANPADS mounted on the　Najin. You can look the Najin class. This photo was taken in 2012. This is a supplement to the article that I wrote before. the last one was the KN-09, that was basically linked with this rumored 300mm rocket system close to the Smerch. However i've seen (i should re-find the source) the term used also to the Kh-35 test launches. Speaking of "KN-11" for a new missile tested for the submarine. This could means "KN-10" is the name given to the Kh-35? North Koreans have come up with a system to raise and lower the mounting rack to a 'launch' and 'flat' to the reduce the ships radar signature.